SOD-IST Rooibos Soap contains extracts from the rooibos plant which only grows in the Cedarberg Mountains in Western Cape Province, South Africa. The plant is rich in goodness from the sun’s rays. 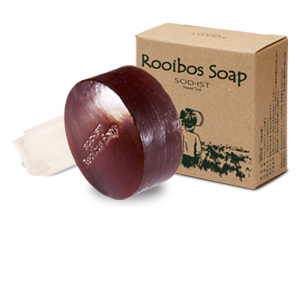 SOD-IST Rooibos Soap can be used on delicate skin as well as the entire body, and leaves your skin feeling clean and moist – never taut or dry. * Contains no coloring, fragrance or preservatives.